As one of the most successful and beloved clubs in England, Arsenal Football Club was always a magnet for the public. Tradition-wise, their results speak for themselves; in addition to winning 27 major domestic trophies, Arsenal hold the records for longest unbeaten streak and longest run in top flight of English football. 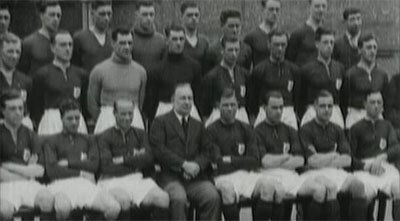 The squad in 1925 with Herbert Chapman sitting in the center. Arsenal FC started life as a works team named Dial Square in 1886. Shortly thereafter, the club turned professional and changed its name to Woolwich Arsenal, becoming a full-fledged member of the Football League in 1893 (the first club from the south parts of the country). The following period was fraught with difficulties for the club; besides not being able to form a team that could challenge for the title, Jim was geographically isolated from the rest of the league, which resulted in low attendances. After teetering dangerously close to bankruptcy, the club was bought out by businessman Henry Norris in 1910 and moved to North London in 1913 (Highbury became the new home ground). The following year, the club was renamed to Arsenal. The club's first rise to prominence came with the hiring of Herbert Chapman as manager in 1925. In the process of modernizing many aspects of the club, Chapman improved the training regimen and made efficient changes to the club's traditional 2-3-5 formation. After following this up by signing a couple of star players, Arsenal won their first major trophy in 1930, defeating Huddersfield Town 2-0 in the FA Cup final. This proved to be the beginning of a fruitful period for the club; during the 30s, they claimed five league titles and another FA Cup trophy. The post-WWII period saw the club continue on their path of prosperity with another two League titles (1948, 1953) and an FA Cup (1950). Those were the last trophies the club would see for the next seventeen years, however; with their best players retiring or leaving for more successful clubs, Arsenal fell into a slump of mediocrity. After winning their first Double in 1971, it seemed like the club's fortunes had finally turned. Yet, this was followed up by a long string of second-place league finishes and losses in Cup finals, with the 1979 FA Cup victory being the only bright spot on their record during this time. They were a little more successful under George Graham, whose defense-oriented mindset proved a good fit with the club's players. During Graham's nine years in charge (1986–1995), Arsenal won two League titles, two League Cups, an FA Cup, as well as their first and only Cup Winners' Cup by defeating Parma 1-0 in the final (they had been very close to win the 1980 Cup Winners' Cup Final, losing against Valenca in the final after a penalty shootout). Arsenal would become far more watchable with the appointment of Arsène Wenger. The then-unknown French manager immediately transformed the club into a goal-scoring behemoth, partly by successful import of French players such as Robert Pirés, Patrick Vieira and Thierry Henry. Henry was incredibly effective as the lace of the team's attack. Between 1996 and 2004, Arsenal claimed three League titles and three FA Cups, with the 2003–2004 season being particularly noteworthy due to the club not losing a single game in the Premier League. That squad, powered by Henry's 30 goals in 37 matches, was later dubbed "The Invincibles". Under Arsène Wenger's management, Arsenal has been known as a club that doesn’t buy big names, but instead finds talents through excellent scouting. An exception, however, was the transfer of Mesut Ozil from Real Madrid in 2013. He did cost £42.5 million, a transfer record for the club. As one of the top clubs in England the capacity of 38,419 at Highbury was not enough. 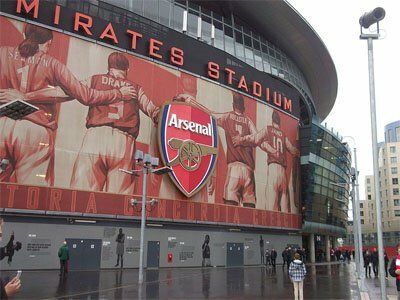 Arsenal wanted to expand the stadium, but was not given permission. Therefore, they had to build a new stadium and in 2006 Emirates Stadium was ready for first kick-off with potentially over 60,000 in the crowd. Outside Emirates Stadium in 2015. In recent years, Arsenal has been somewhat of a perennial bridesmaid. While the club was always among the favorites to win the league, a string of major injuries and/or disappointing losses would inevitably see them tail off in the title race. As a sort of consolation prize for the club's fans, the three additional FA Cup trophies in 2005, 2014 and 2015 have made Arsenal the most successful club in the competition's history. The missing trophies finally led to the departure of Arsène Wenger in May 2018, after 22 years in the club. The early crest included three canons and was influenced by the heraldic arms of the Royal Borough of Greenwich (the club was in its early years based in Borough). Over the years the Arsenal logo has been modernized into a more simplified fashion. 1886 The club is established (as Dial Square, changes to Royal Arsenal the same year). 1893 The club joins the English football league system (as Woolwich Arsenal). 1904 First season in the First Division. 1913 The club move to the Arsenal Stadium (Highbury Stadium). 1914 The club is renamed to Arsenal. 1925 Herbert Chapman is appointed as manager. 1930 Winning their first FA Cup title. 1931 First time national league champions. 1933 White sleeves on the shirt is introduced. 1970 First European cup trophy (Inter-Cities Fairs Cup). 1971 Winning their first Double (the First Divison and the FA Cup). 1986 The former Arsenal player George Graham is hired as manager. 1986 First League Cup title. 1993 First European Cup Winners' Cup title. 1996 Arsène Wenger is appointed as manager. 1999 Thierry Henry is transferred from Juventus. 2006 The club move to the Emirates Stadium.